Last week I went to be part of a project called ‘Warriors of the Dream’ at St Phillips Church East Harlem. The group had been so called after the words of Ozzie Davis, friend of Martin Luther King Jr, to a group that had achieved their goals despite everything the world had thrown in their path, saying: ‘You are my warriors of the dream.’ The warriors are those people who, in the power of peace and justice, build, create and lead. The group explores their own history: Martin Luther King’s own dream, the dreams of their elders and the dreams of their future. Influenced by movements such as #blacklivesmattter it has been set up in recognition of the difficult challenges that face many of the young people living in Harlem, and in recognition of all the potential that they have to change their futures. The group gathers like church to share time, food and fellowship. This time has a purpose of hearing God: for the group this is pursuing transformation of themselves and their neighborhood. The worship and liturgy takes place in the form of a drumming circle. The practice of drumming connects the group with their own roots and deep history, but also with a power that goes beyond words. It is a place for contemplation, but also for an acknowledgement of the power that the group has as a force for positive transformation. Scripture and spoken word is also incorporated into this practice, as is reflection, dialogue and listening across the group. So often dreams for hope and peace are characterized by passivity and quiet in our churches – the latter is no bad thing in itself. Yet when these young people that same day have woken up to more news that more riots are breaking out in Baltimore after black men have been killed unlawfully by white police, quiet just doesn’t cut it as an response. There is a place and need for anger, for feelings of betrayal, abandonment and grief to be shouted out in a way that is also a call for change, for truth and for transformation. As I sat in the circle I watched more and more people join us from the local area and pick up a drum. As David the drumming leader said, you don’t need to be an expert to play the drum, you just need to touch it to make a noise. For me this is also a metaphor for any way in which we can stand up for truth and justice – we don’t need to be an expert on the law, we just need to say the truth our loud, to be counted, we just need to hit the drum. 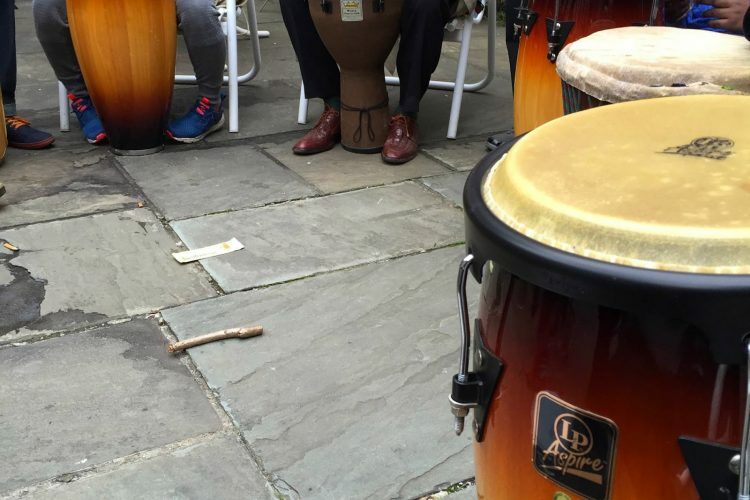 Usually traffic horns and sirens dominate the soundscape of Harlem, but this Sunday afternoon djembe drums could be herd several blocks away from where we were, and a few people stopped by to join in and share. One hearer said it was as if his soul was sleeping, he told us ‘the drums called it into action’. This was a liturgy that was accessible, but also real, that captured the feeling and emotion of a community, but also proclaimed the presence of God in a place of conflict and destruction; the presence and power of hope in the midst of despair.